The Slowstar Juicer has a low speed of 47 RPM with a 200 watt motor and 3 reduction gears resulting in the equivalent amount of torque as a 9 HP motor. 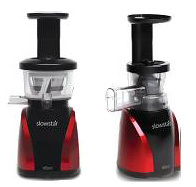 The Slowstar Juicer creates more than twice the power compared to similar slow juicers that run at 80 RPM with a 150 watt motor, which produces a 4HP equivalent. The low 47 RPM ensures that you will not lose the freshness, quality and enzymes in your juice due to friction and heat. The Double-edged Duoblade Auger - The SlowStar Duoblade on the augur automatically cuts your produce, such as celery, kale and wheatgrass, easily breaking down their stringy fibers. This makes it possible for the Slowstar to rapidly cut and juice your produce at a low speed for higher yields and reduction of pulp in the juicer. The Mincing Attachment turns Slowstar Juicer into a multipurpose tool that allows you to c reate your favorite recipes like sorbets, nut butters, pate and sauces. 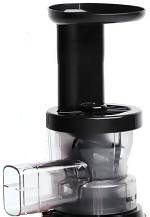 This separate homogenizing attachment makes the Slowstar Juicer / Mincer a more versatile kitchen appliance. Whether you are juicing your favorite fruits and vegetables or using the mincing attachment to make sauces and sorbets, the Slowstar Juicer / Mincer is the perfect solution to get the most our of your produce. Heavy Duty Juicing Screen for durability. and the other attachment for sauces, nut butters and more.